The 1988 Christmas guilty pleasure will spread the Blu-ray cheer this November! 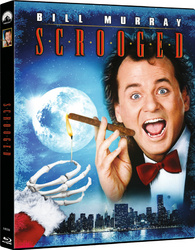 In an early announcement to retailers, Paramount says 'Scrooged' is planned for a Blu-ray release on November 1. In this modernized adaptation of the Charles Dickens' classic, Richard Donner directs Bill Murray as a selfish and ruthless corporate executive who is visited by three ghosts from his past to show him the error of his ways. The Blu-ray will feature 1080p video, a DTS-HD Master Audio 5.1 soundtrack, and the only supplement appears to be the theatrical trailer. You can find the latest specs for 'Scrooged' linked from our Blu-ray Release Schedule, where it's indexed under November 1.